Bono: "Elvis Woke Up My Heart"
The poetry doesn't rise to a Shakespearean level, but the sentiments in Bono's tribute to Elvis Presley seem heartfelt. In an unusual performance, the U2 frontman - a pal of presidents - reads an original poem honoring America's original rocker as part of the BBC's poetry season. "Elvis woke up my heart," Bono says near the end of the work, which celebrates Presley's small-town Mississippi roots and global influence. It will be broadcast May 13 on BBC Radio 4 after more than a decade of sitting on a shelf waiting for a producer to give it a proper treatment. The singer, best known for his humanitarian efforts, hails Elvis for his early work, when the former truck driver emerged from the Memphis music scene to shake America to its very roots. "Elvis was made by America so America could remake itself," Bono reads. His words are mixed with comments by Presley and others, and sections of some of Presley's classic songs, including the haunting "Mystery Train." It is clear from Bono's poem that Presley's influence extended to Ireland, where Bono first heard him as a young boy, and to Liverpool, where lads named John, Paul, George and Ringo heard Presley's early hits. 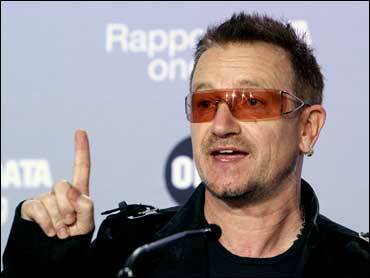 "Elvis invented the Beatles," Bono says in the poem. The poem was recorded by Ten Alps Radio director Des Shaw near the end of an interview with Bono more than 10 years ago. The topic was Sun Studios, the small Memphis studio Elvis made famous. Shaw said Bono offered the poem near the end of the discussion. "Elvis has millions of fans around the world, and Bono is one of them," said Shaw. Although the poem was reprinted some years ago in a fan magazine, it has never been performed or broadcast, in part because producers could not figure out how to showcase it. Finally, producers decided to prepare a 15-minute broadcast to coincide with BBC's poetry season, with added snippets of Elvis' music and other material. "It lay around for a long time with a lot of producers and editors trying to turn it into a soundscape," said Shaw. "It couldn't be a cold reading, so producer Chris O'Shaughnessy put it together. He had been collecting various pieces of audio for quite a while and he selected pieces that complement lines of the poem." The finished piece is an impressionistic narrative about Presley's career, with Bono's poem at its center. Bono and U2 have often praised Elvis and even traveled to Sun Studios in Memphis to record their "Rattle and Hum" album. Bono made it a point to use a microphone the King had used and to quiz producers and session men about Presley's recording technique. Shaw said Bono and millions of others have found inspiration in Presley's story. "It seems the more you look into Elvis the more you realize exactly what a groundbreaker he was," said Shaw. "He was breaking down boundaries."